After a hectic week of school it was nice to get out from behind the desk, but the weather today wasn’t particularly cooperative. 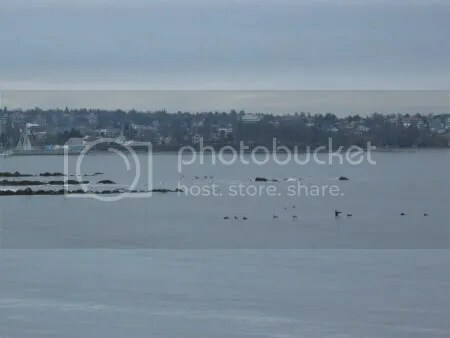 It was raining off and on throughout the day so I decided to head out to Ambleside Park in West Vancouver which offers some decent birding, even in the wet. The pond was pretty busy, as usual. 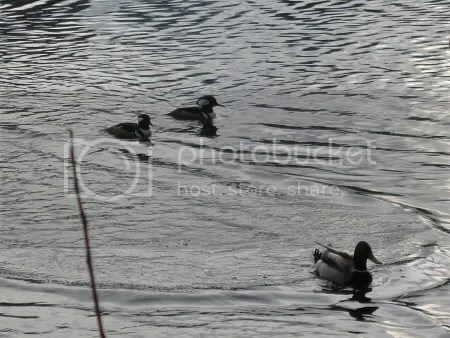 Common Goldeneye, Lesser Scaup, Bufflehead, Mallard, and American Widgeon were all going about their daily activities. 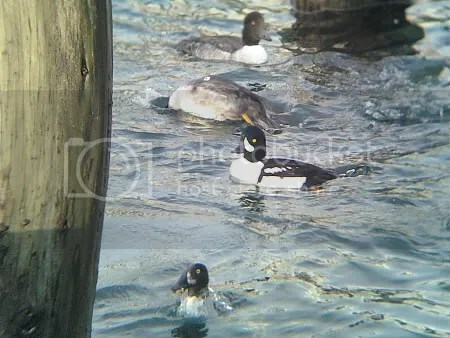 Some of the male Common Goldeneye were partaking in courtship displays. 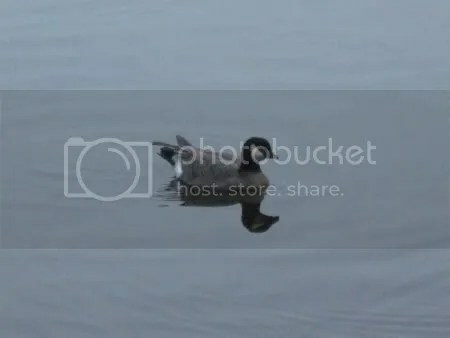 Several males were doing the “masthead” display “in which the male lowers and stretches his head parallel to water for up to 3 s, then quickly jerks his head upright pointing bill vertically, then snaps his head back down to water level and holds it there while paddling” (1). 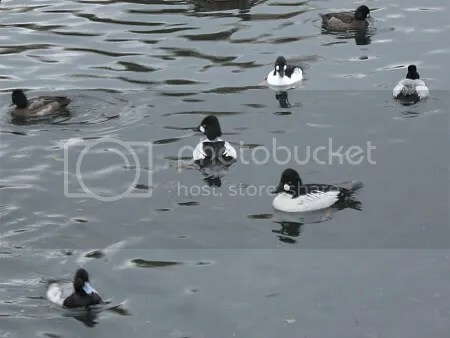 Out on Burrard Inlet there was a group of Harlequin Ducks swimming in single file and making the occasional dive for marine invertebrates or small fish (2). Even though the weather was a bit iffy I still had an enjoyable, if short, time out birding. Gaines, W. L. and R. E. Fitzner. 1987. Winter diet of the Harlequin Duck at Sequim Bay, Puget Sound, Washington. Northwest Sci. 61:213-215. Upon scanning the salt marsh I spotted a male Eurasian Widgeon among a group of American Widgeon. The ducks were milling in and amongst the flooded marsh plants with a couple of Green-winged Teals. Unfortunately the birds were too far away to get any recognizable photo when I held my camera up to my bins but this picture shows the characteristic bright russet-red head of the Eurasian Widgeon… or at least I think it does. After ten minutes or so of observing the Eurasian Widgeon I noticed a group of Northwestern Crows making a bit of a racket. One of them made a swooping pass at something perched in one of the conifer trees near the McCartney Creek outflow. It turned out to be a Red-tailed Hawk; a familiar bird of the street lights of Highway One but uncommon at Maplewood according to the WBT’s checklist. I wonder if it wasn’t contemplating making a meal of the ducks directly below in the salt marsh; waterfowl are occasionally prey for Red-tailed Hawk, among many other animals (1). 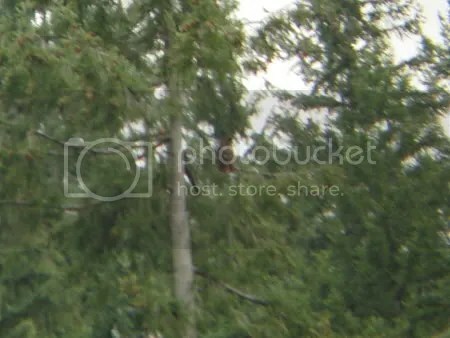 At least in this photo you can see the hawk and the reddish tail that gives the species its name. It was nice to get out from behind the desk and do some birding even if it was only for a short time. It’s been raining in Vancouver for about the last week but today there was a break between weather systems; conveniently occurring on the weekend. I arrived shortly after 10:30 to a chorus of birdsong. It seemed as though the birds were just as happy about the sunshine as I was. 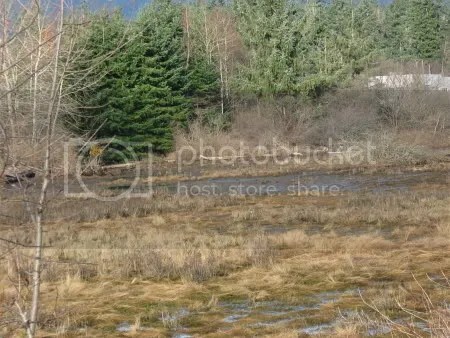 The tide was receding when I checked out the mudflats but water still covered the majority of the area. Most of the activity was at the McCartney Creek outflow; gulls were preening, bathing, and resting while a Great Blue Heron slept on one of the pylons. There were surprisingly few ducks about; only a handful of American Widgeon were near the creek outflow. Looking south from the Old Barge Channel I spotted a Common Loon as well as a Pelagic, and juvenile Double-crested Cormorant. After a few minutes of observation a Black Oystercatcher flew past; it was just a couple of inches above the water and it was heading in a north easterly direction. I checked my notes on this species when I returned home and it seems that this is only the third time I’ve seen one in flight. At Otter Point a pair of Hooded Mergansers were swimming close to the viewing area and several Common Goldeneye were diving further out. As I looked north over, what is usually, a grassy area I realized where all of the ducks had gone. 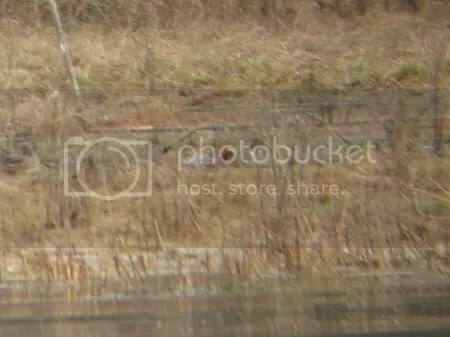 It seems that all of the rain we’ve had lately has created some shallow ponds/very large puddles and the ducks decided to take advantage of this. Northern Pintail, Green-winged Teal, Mallard, and American Widgeon were all there. 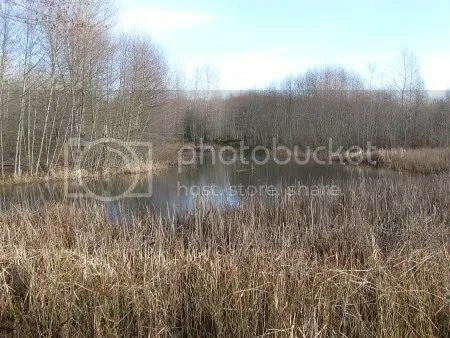 Upon arriving at the westernmost West Pond viewing area I noticed a lone Ring-necked Duck diving and dabbling for food. This species feeds on tubers, aquatic invertebrates, and aquatic and moist-soil seeds (1). At one point it surfaced with a plant in its mouth; it quickly ate part of it, tossed the rest back into the water, and made another dive. Mallard, American Widgeon, Northern Pintail, and American Coot were also present at the pond. Further up the path in the forested section of Maplewood I came across a tree with some House Finches and a fair number of Pine Siskins in it. They blended in so well with the dried leaves still on the tree that one might think the leaves themselves were moving if it weren’t for their calls. I’m so happy that the weather cooperated this weekend; after being stuck behind a desk doing homework for a week I need to get outside. 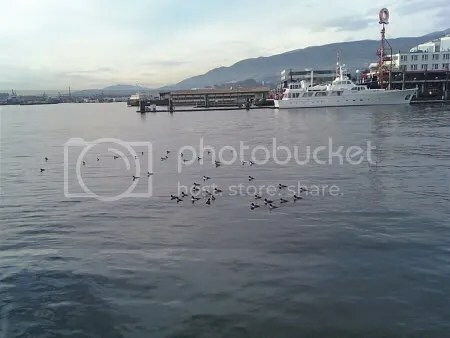 Last week Tuesday I was out running some errands in the Lower Lonsdale neighbourhood and I decided to have a stroll down the Burrard Dry Dock Pier. I wasn’t “prepared” per say for birding but I always carry a small pair of Bushnell Powerview 10×25’s in my jacket pocket; arguably horrible binoculars but better than nothing. It was a good thing I had those binoculars because there was about 49 Barrow’s Goldeneye and 13 Western Grebe among other birds in the vicinity of the pier. The Barrow’s Goldeneye were diving in and amongst some wood pylons close to shore. Initially some of them appeared a bit nervous of my presence on the pier, which was only a few meters away from where they were diving but they soon returned to feeding. 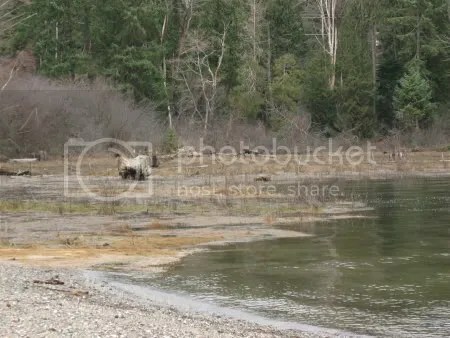 Insects, molluscs, and crustaceans form a major part of this species diet and food is most often taken in shallow water along the shoreline (1,2). The water was clear enough for me to watch some of them foraging underwater; with their tails spread out and wings clamped close to their bodies they make for agile swimmers (3). As I walked towards the end of the pier I spotted thirteen Western Grebe; most of which were preening and resting while one or two cruised along the water’s surface. Always having a pair of binoculars on hand, even when the purpose of one’s outing isn’t birding, has paid off for me on several occasions and I’m sure many of you who are reading this keep a spare pair in some convenient location. After all there are birds everywhere and one always has to be ready for action! Munro, J. A. 1939. Studies of water-fowl in British Columbia, Barrow’s Golden-eye, American Golden-eye. Trans. R. Can. Inst. 24:259-318. Palmer, R. S. 1976. Handbook of North American birds, Vol. 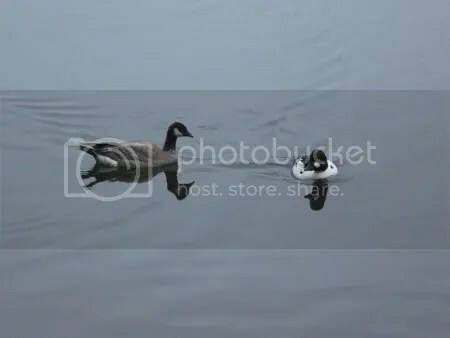 3: waterfowl. Pt. 2. Yale Univ. Press, New Haven, CT.
Monday provided me with another excellent day of birding, this time at Lost Lagoon and Second Beach. A large portion of Lost Lagoon was covered in a thin layer of ice; this meant that most of the activity was close to shore and easily observed. The pond at Coal Harbour by Georgia St. was also completely frozen over. 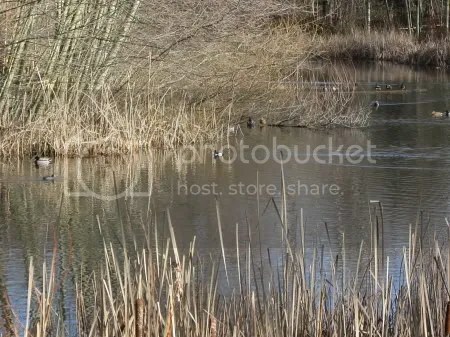 At one point while walking along the eastern shore of Lost Lagoon I came across a Mallard standing on the ice looking at passersby for a handout. I stopped to watch him for a bit with the intention of getting a few photos when the ice suddenly gave way and he plunged into the water. I admit to having a bit of a chuckle at his misfortune and he must have heard me because he gave an angry quack in my direction before flying off. There was quite a bit going on at Second Beach. 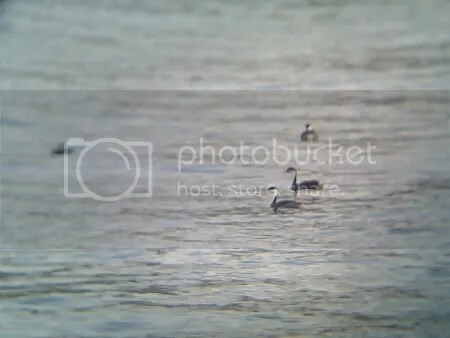 A group of Surf Scoters were diving close to shore, several Barrow’s Goldeneye were foraging near the rocks, and further out some Harlequin Ducks were also feeding. There was also a flock of Canada Geese on the water and with them a single Cackling Goose. Upon returning to Lost Lagoon I found another two Cackling Geese at the west end with several Canada Geese. The Cackling Goose typically winters in Oregon and southern Washington; a few also winter in the Sacramento and San Joaquin valleys of California (1, 2). So it is uncommon to see them in Vancouver. In fact the Stanley Park bird checklist records the Cackling Goose as a rare sighting in the park during the winter. I had a great time birding on Monday. 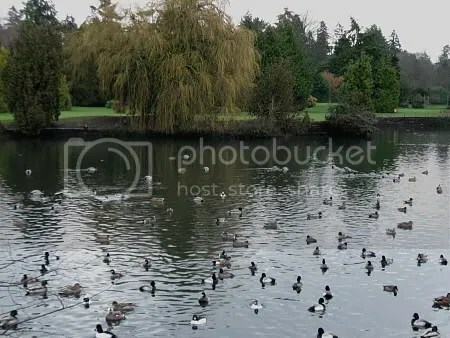 I usually find Stanley Park to be fairly productive during the winter despite the abundance of people and dogs; two factors that can often lead to poor birding. Vancouver is lucky to have such a place so close to the city center. Gilligan, J., M. Smith, D. Rogers, and A. Contreras. 1994. Birds of Oregon: status and distribution. Cinclus Publ. McMinnville, OR. Small, A. 1994. California birds: their status and distribution. Ibis Publ. Co. Vista, CA.